Robert Hooke was a scientist, artist, and nemesis to Isaac Newton. In his spare time, he engaged in one of the most celebrated science art projects. To do so, he was forced to get an ant drunk. Yes, really. The artistic and scientific project in question was the Micrographia, a book of detailed and beautiful drawings of insects and other living things. It presented the bugs and mosses that people saw every day in a new light. Rather than being a sign of decay, disease, or dirt, they became a part of nature, and a work of art. The trouble, Hooke found, was getting the insects to stand still and be sketched. A less compassionate man might have killed them. Hooke got them drunk. 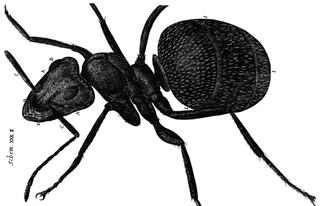 He specifically describes drunkening up an ant, saying, "I gave him a gill of brandy, which after a while knocked him down dead drunk." The ant puked up some bubbles, but was none the worse for wear. According to Hooke, after an hour it, "suddenly reviv'd and ran away."